This week, Lucy Janes, a volunteer on our World War One Home Front research project, shares one of the more surprising stories she’s discovered so far during her research. When imagining the students of The Glasgow School of Art at the beginning of the 20th century it’s easy to conjure up some visions: Dreamy-eyed, thoughtful young people with artistic clothes – young men with longish hair and big floppy cravats and young women in painter’s smocks and long beads with curls pinned up on their heads – earnest yet excited about the challenges of the modern world. Which is why it’s always a good idea to check the actual facts! Because when I looked into The Glasgow School of Art archives I met Mr Allan McLymont Ure, industrialist, public figure, justice of the peace and amateur sculptor. Iron founder Allan McLymont Ure was involved with The Glasgow School of Art both as a student and as a member of the governing body. He started evening classes at The Glasgow School of Art in 1912, when he was in his forties. He continued to take classes, mostly in the evenings, until 1931-32, missing only the years 1917-18 and 1929-30. He studied life drawing for a short time but later focused solely on modelling and sculpture. Born on 12 December 1868, he lived in Hamilton Drive in Glasgow. He was associated with Allan Ure & Co which was based at the Springbank Foundry in Keppochhill Road, Cowlairs. You can see more about the company and the patented Ure interior cooker – a combined cooker, fire and water heater designed to look like a fireplace – on The Glasgow Story website. The Springbank Foundry closed in 1968. He is described in the Dictionary of Scottish Art and Architecture as a Glasgow amateur sculptor who created portrait busts and who exhibited 10 times at the Royal Glasgow Institute of Fine Art between 1915 and 1933. Allan Ure served as a bailie, a legal role in local government in Scotland similar to a magistrate or bailiff, until 1925 and was also a Justice of the Peace (JP). 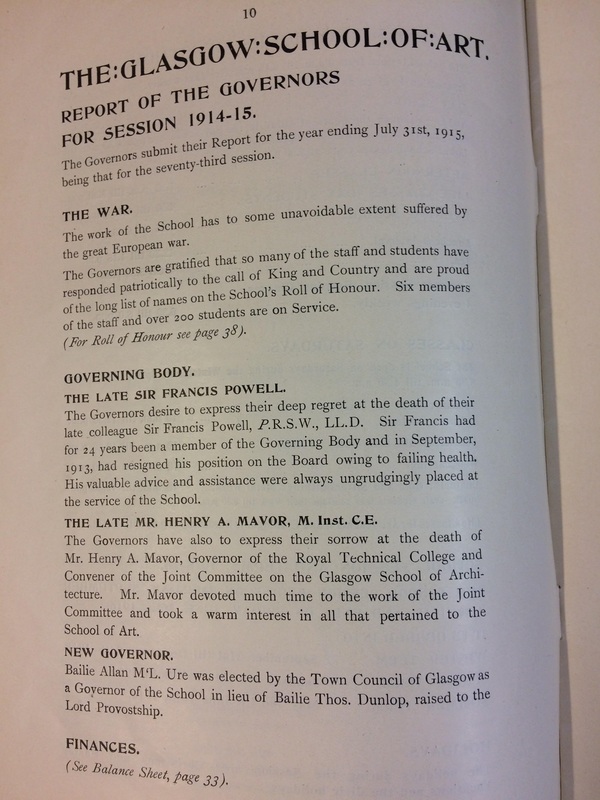 He also served on what was then Glasgow Town Council. In 1913-14 he was elected by Glasgow Town Council as a Governor of The Glasgow School of Art and continued in that position until 1930-31 when he retired. From 1917-18 he sat on the School and Staff Committee until 1931 and also sat on the Modelling and Sculpture Committee of Assessment for Diplomas, Travelling and Maintenance Scholarships and Bursaries from 1920 until 1932, after he retired. So Bailie Ure was taking art classes at the same time as helping to run The Glasgow School of Art, oversee his family manufacturing business, carry out various public duties for the city of Glasgow, and also find the time do create some accomplished sculptures. We don’t know what he was like as a person but it was a pleasure to ‘bump into him’ as part of my volunteer work with the Archives and Collections Home Front project. 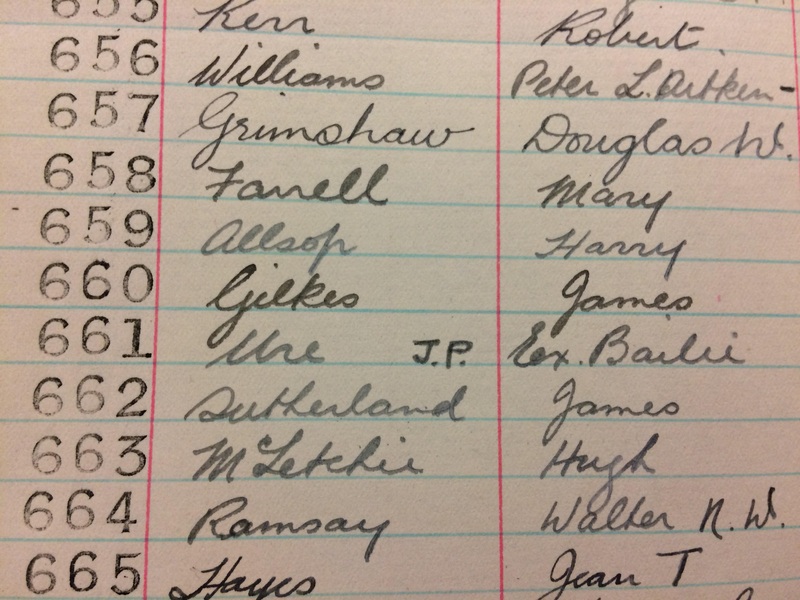 He was tucked in among the pages of The Glasgow School of Art student registers and annual reports; a nice reminder that there are always new stories to find.